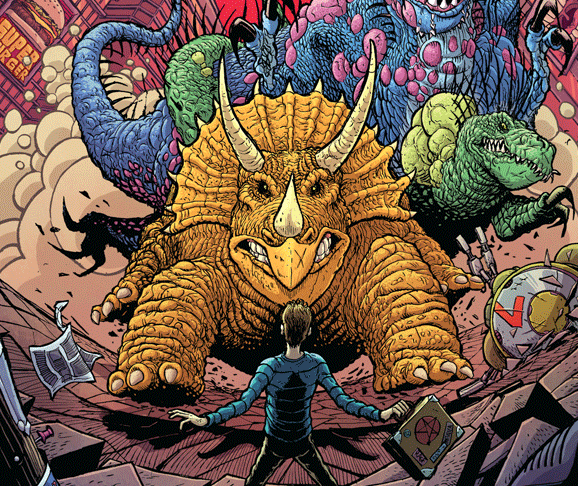 Leviathan # 2 Review: Demons, dinosaurs, nuclear waste, and true love – AiPT! Leviathan knows how to have fun. Created by John Layman and Nick Pitarra, Leviathan from Image Comics knows how to have fun. That is an obvious statement when talking about a book that deals with mutant dinosaurs, monsters summoned by someone named Goth Jimmy, and a battalion of mechs equipped with gigantic guns and saw blades. What makes Leviathan different is all of the imposing creatures and weapons are window dressing for a tender love story. The second issue of Leviathan picks up where the debut ended. After the shocking conclusion to the first issue, Ryan Deluca’s girlfriend is left for dead in the hospital. Layman had already done a great job of showing how strong the relationship between the two was in the last issue and continues to build the bond. The opening pages are touching and further show just how much Ryan cares for his fallen partner. This continues throughout the issue as Ryan becomes more involved with trying to figure out what put Vee in the hospital and how he can stop it from doing more harm. Layman’s writing is what makes Ryan’s character so endearing. Leviathan is dealing with unrealistic circumstances in a very relatable way. The issue begins with Ryan talking with the doctor caring for Vee. What follows is a conversation that happens in multiple hospitals across the country every day. Instead of grabbing the doctor and yelling at him about how uncaring doctors are as long as they get paid (a common occurrence in action stories), an obviously worried Ryan explains how he was just about to propose and asks if there is anything he can do to help. The scene is touching in its realism and adds depth. Later, when Ryan does start to do things that are more in line with the supernatural nature of the story, readers can readily accept this as just something any normal person in the same situation would do. The character development is never heavy handed while engaging the audience. Pitarra’s art melds perfectly with the story that is being told. A daring mix of over the top expressions, cinematic layouts, and detailed expressions the look of Leviathan continues to get across the tone of the book. Ryan constantly looks worried and frustrated while General Tomesina Jaspers has the dedicated no nonsense look of a soldier. Just by looking at her, a person can tell that she knows everything she decides is the right decision. This is highlighted by an comical exchange she has with the ridiculously drawn Professor Johanssen Avery. Michael Garland’s color work is amazing and adds to the extreme nature of the story. From bloody battles with mutated dinosaurs to hurried exchanges with Catholic priests, the book has a lush look that is captivating. Garland and Pitarra work together to flawlessly capture the essence of Leviathan’s world. At its core Leviathan is a love story, but it is also one where dinosaurs exist beneath the earth’s surface. Add a creature summoned from another and the world’s largest military force and you have an action packed adventure that never lets up. The book is also very funny. Leviathan is a wonderful mash up of everything readers want in comics. There are compelling characters, strong action, great humor, stunning artwork and a touching love story. Leviathan is proof that the best comics do not have to be the most serious. Leviathan is an action packed book that is sweet and will also make you laugh. Plus there are mutated dinosaurs.